Fruitless Pursuits: Jesus Christ Superstar Arena Spectacular 2013 - Australian tour! This re-imagining of the now 42-year old Jesus Christ Superstar arose out of a British reality TV show called Superstar, created and judged by Sir Andrew Lloyd Webber. The idea was that the ultimately successful contestant would win the world touring role of Jesus in this production. 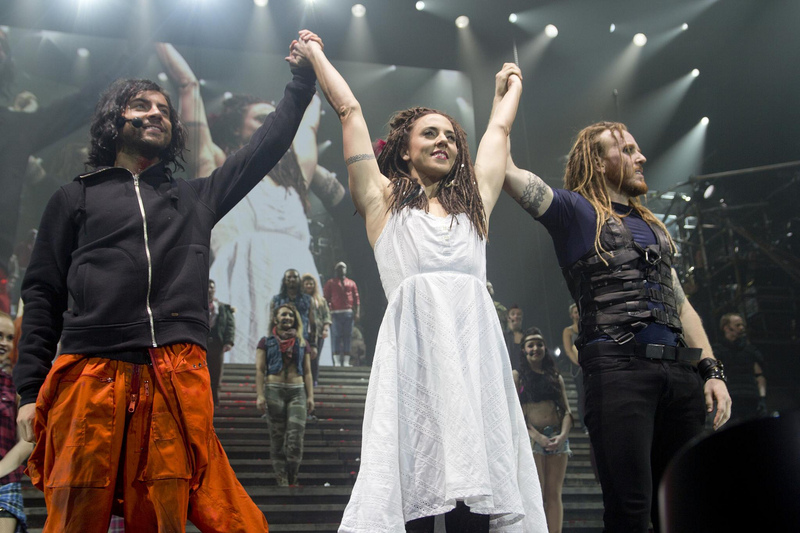 The winner was the beautiful Ben Forster, who was a profoundly gentle Jesus up against the steamroller of Tim Minchin’s Judas. 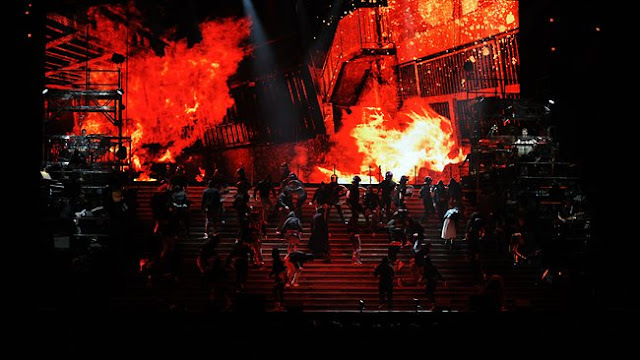 The production was reset against a V for Vendetta/London Riots backdrop of social unrest, complete with Molotov cocktails and looting and riot police. The stage was a massive bank of stairs with the band split in two on either side. Panels in the flooring shifted to allow for exits and reshaping the environment, and all kinds of crap descended from the roof and rose from the floor. It was an incredibly versatile set, even if the idea of every entry having to be down a massive flight of stairs towards the audience gives me the shakes. Rounding out the 2013-ing, hashtags of #RomeLies and Follow #theTwelve were spray painted and flashed about the place, along with some hefty reality-TV referencing that I’ll go into later. Tim Minchin is a bigger deal in the UK/Australia than he is in the US, and therefore it’ll a bit difficult to understand the appeal if you haven’t seen him in action. He’s a bit odd looking, a bit idiosyncratic, a bit volatile, and such a drastic departure from what I’d expect in a stage musical role in general that it was a bit difficult to imagine how exactly he’d fit. Happily, they sidestepped this issue by completely re-jigging the visuals and conceptual angle of the traditional JCS into something that fit around him. I do wonder whether his casting happened before or after the reimagining. 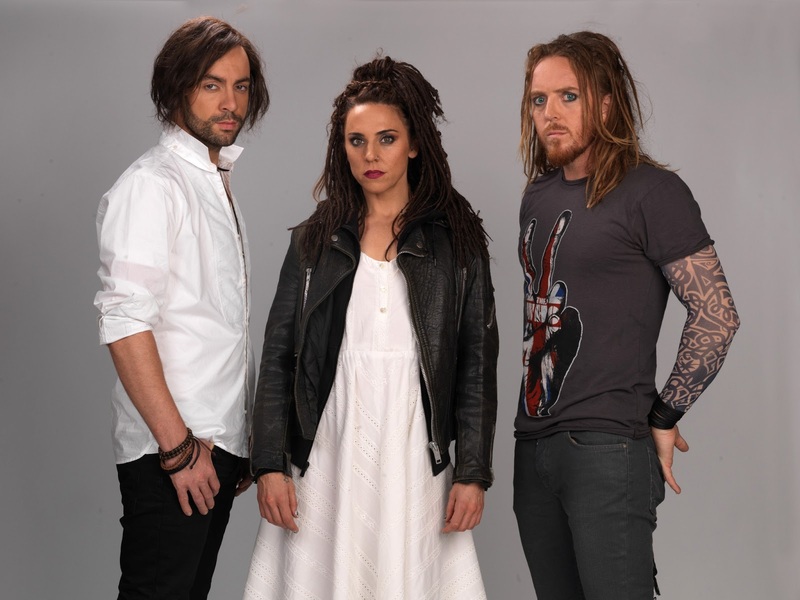 Minchin’s voice takes a bit of adjusting if you’re unfamiliar, but relatively quickly it all makes sense, and you realise that his Judas is a gamechanger. He’s angry and despairing and conflicted and a vein-popping, sweaty, raging beast. When Judas’ death comes around, it feels completely warranted. Elsewhere in the casting is a whole lot of you-get-it-when-you-watch-it choices, led up by a wonderfully roughed up Melanie Chisholm (Mel C), through whom I discovered that the Spice Girls vocal was about 80% her. She powered through her sadly few appearances – Mary has always been a bit of a thankless role. What’s interesting is that this time around they leaned her into more of an adoring, motherly role towards Jesus as opposed to a romantic interest. It was a wise choice. Mary’s more traditional mooning-over-a-dude attitude always felt a bit perplexing, considering the volatility and danger of their situation. Mel C’s adrenaline/excitement/fear delivery felt a far better fit. 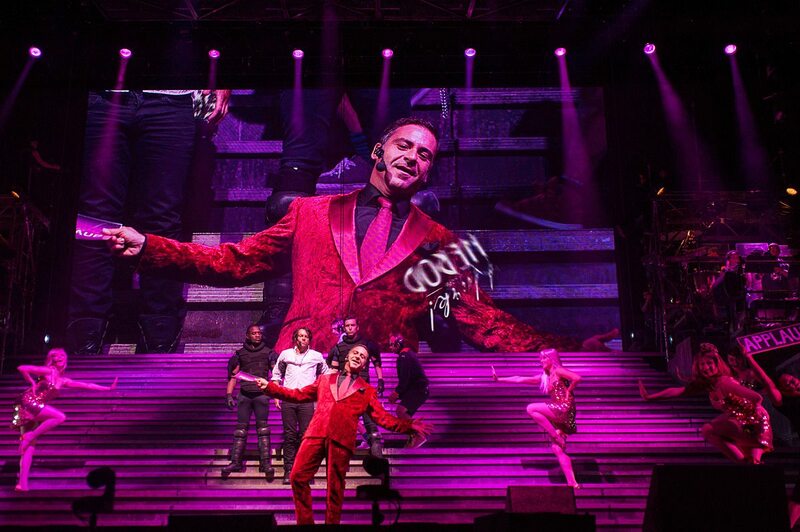 Ben Forster himself is a little hard to gauge, since directly after this performance he handed the role to his understudy for three shows while battling an infection. He has a beautiful voice, and he looked great, and he had some great moments – but he wasn't an actor, and his voice was a bit weak in the higher registers. Which is unfortunate for Jesus, since he only vocally arcs up when he’s riled, which is when it’s most important that he’s strong. 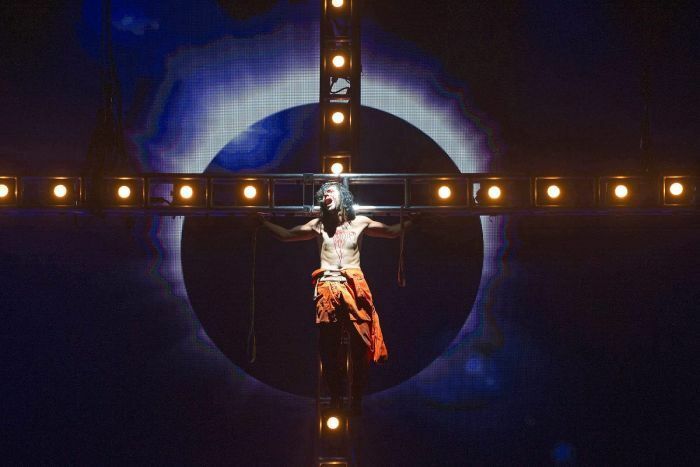 Sadly it made Gethsemene, my favourite JCS moment, a bit of a shadow of what it could have been. I grew up on John Farnham’s Jesus from the 1992 Australian Cast edition, and Farnham’s voice is a groundshaker, especially in the higher register. The UK sported a different Pilate and Herod to the Australian leg of the tour - we got Jon Stevens (Noiseworks, post-Hutchence INXS) as Pilate and Morning TV and Deal or No Deal host Andrew O'Keefe. And having seen some clips of Chris Moyles' Herod, we got a really good deal with O'Keefe. Herod in this variant of JCS is a reality TV host, complete with dial-in voting, twitter hashtags and a Lord or Fraud poll. And lots of dancing girls in glitterly gold minidresses. So good. O'Keefe was a schmoozing grinning fiend and such a glorious send up on his own brand of schtick that I think I was nearly in tears at some point. Oh man, O'Keefe. You are a glorious creature. And I feel bad for this Alex Hanson character, because I had to dig so hard to see who did Pilate in the UK, and I have no idea how he went in said role. But goddamn, Jon Stevens. He played Judas back in the 1992 Australian Cast (aforementioned) tour, which again I was extremely familiar with, and thus very stressed with the two way pressure of comparing his Judas to Tin Minchin's and his Pilate to John Waters (1992 Aus JCS). It's definitely tense being a nerd in a musical. Shouldn't have worried. Dude can act, dude can sing, dude has some serious guns. I said to fellow FP contributor Jacinta afterwards - "When did Jon Stevens become such a hot old man?!" to which she replied, with a look of tolerant superiority, "he never stopped being a hot old man." And fair enough. He has a massive presence and the gravel of someone far more used to fronting rock bands and he does menace well. I was impressed. And a little overly warm. By this stage, the Australian leg is winding up. There's some Queensland dates and and few Victoria dates, and if you have an opportunity to get into one of these, I'd definitely recommend it. If nothing else, it's worth it for the corseted angels in hotpants dancing to the ultra perky titular track, whilst the dying Jesus bleeds and sobs hanging above them. It was gloriously nasty. A tour de force for all involved, and such a well executed transferal to the current decade. Good work Jesus-team. Awesome review. I always thought you were going to do this! Haha, it was aaall in my head. Ha, if I was going to make one contribution to this, I'm happy for it to be THAT. I saw the first show in Melbourne, and whilst Ben Forster was back from his illness it was evident that he still wasn't well. We also missed out on seeing Andrew O'Keefe, however his understudy was good. I have to say that Judas definitely stole the show though, as an Aussie I am very familiar with Tim Minchin, and he was stunning. Even better than I could have imagined.